The southern catalpa adds a distinctive touch to your yard or street with its showy clusters of white flowers, large cordate leaves, and long skinny seed pods. This tree grows best in USDA zones 5-9. The southern catalpa grows 30-50' tall and wide with an oval shape. Plant in full sun to part shade. The cordate leaves are up to a foot long and 6 inches wide, with short hairs on the underside. Bell-shaped flowers appear between the months of May and July. They grow in clusters and are mainly white with some purple and orange accents. The seed pods may be up to two feet long and 1/2 inch wide, resembling a green bean. Catalpa bignonioides serves as an ornamental shade or street tree. Hummingbirds are attracted to the catalpa flowers. 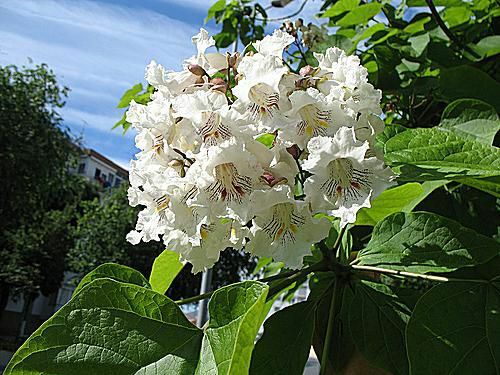 The catalpa can be a messy tree, so plant it in a location where fallen flowers, pods, and seeds will not cause a problem. Sometimes this tree is grown since it is a host for the catalpa worm, which can be used as fishing bait. Plant in a location with soil that is moist and well-drained for best results. The optimal pH range of the soil is 5.5 to 7.0. Plant in an open area away from buildings, plumbing or barriers to avoid root problems. Check with your local extension service. The catalpa can become invasive in some regions. Catalpa can be pruned at any time, but prune after flowering in spring if you do not want to skip a year of blooms. The catalpa sphinx moth larva is a common pest for the southern catalpa. They love to chew through the leaves and may completely rob the tree of leaves. The catalpa worm is collected from the trees for use in fishing as bait. Verticillium wilt and powdery mildew may also cause problems for this tree.